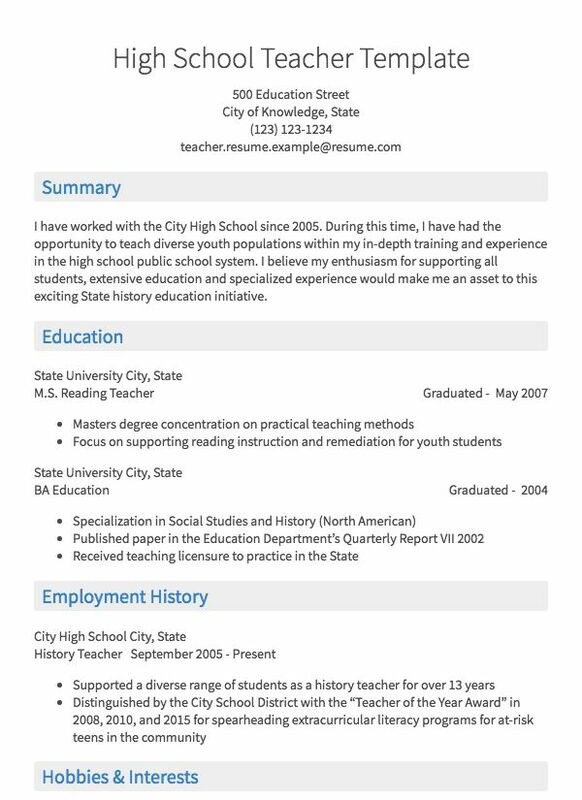 Learn to how to write a teacher résumé with a free sample résumé for teachers (PDF) and expert advice from résumé writing experts. Being a teacher is unlike any other job out there, as all teachers and graduates of teaching programs know. Teaching jobs have specific demands and responsibilities that require specific training and skills -- and a teacher résumé to match. You need to know what the school district or board, administrators, principals, HR, or business owner (depending on job posting) expect to see in your résumé so you can tell them exactly what they want to know about you to get hired fast. 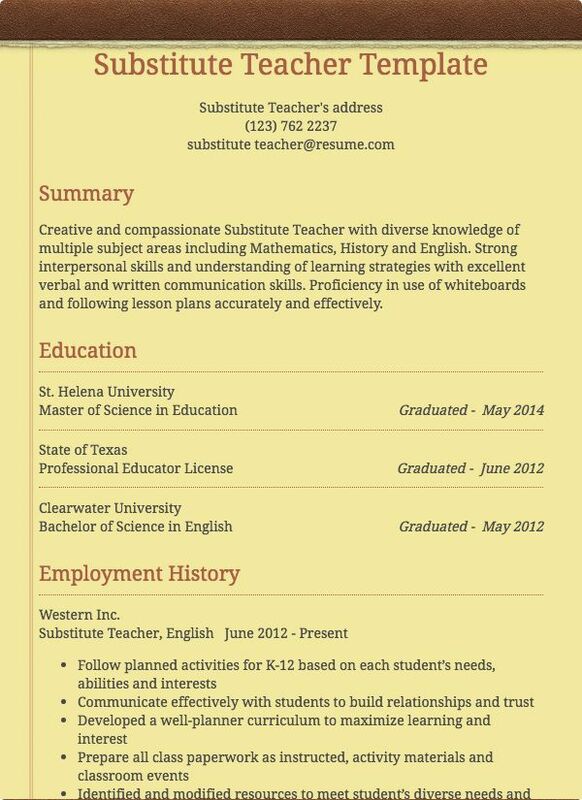 Learn how to write a teacher résumé with free teacher résumé examples in this comprehensive guide from the résumé experts at Resume.com. For a teacher résumé, emphasis should be placed on education and qualifications, skills, areas of specialization, and experience. Focus on including hard (objective) skills rather than soft (subjective) skills. If you’re a teaching professional, it’s a given that you have great time management skills and work well under pressure - no need to take up space by telling the reader this. While applicant tracking system (ATS) technology has long been used in the business world, many educational institutions are now using ATS to streamline teacher recruitment. An ATS helps recruiters and employers to more quickly to identify the most suitable applicants, without having to manually review every single résumé. An ATS is designed to parse – or scan – your résumé against specific keywords in the job description, and rank your application according to how closely it matches these keywords and any other objective criteria (e.g. length of experience). The ‘human’ recruiter then reviews résumés shortlisted as a potential fit by the ATS. It is good practice to include important keywords from the job posting in your résumé that are relevant to your skills and experience. For example, these keywords could be a specific job requirement, such as certifications, or abilities that make you well suited for the role, like speaking a foreign language. However, it is crucial that your résumé is written in a professional and natural way, and not robotic or stuffed with keywords. Whether or not an ATS is used by an educational institution, the style, structure, and details of your résumé should be the same or similar. 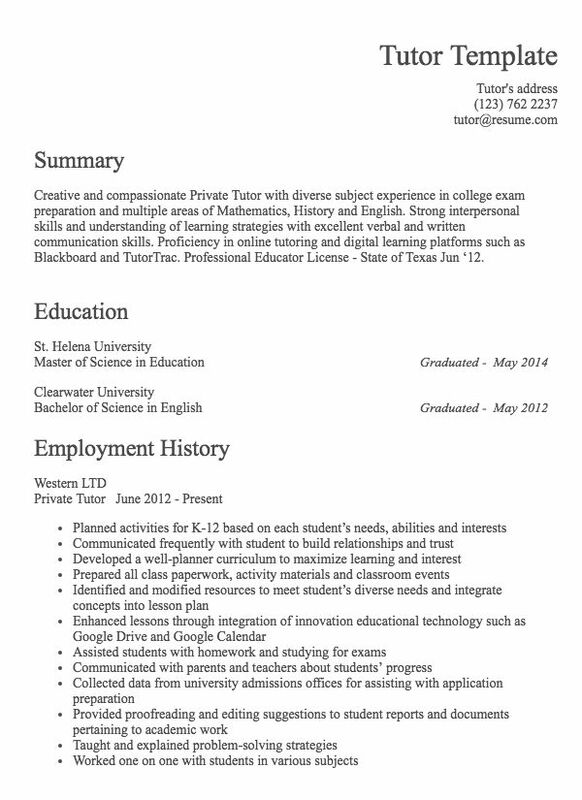 What Formatting Styles are Typically Used for Teaching Résumés? Standard resume fonts use ‘clean’ styles such as Arial or Garamond. Times New Roman is now considered old-fashioned for most résumé types. Font size can range between 10-12, depending on how much information you need to include. Use single line spacing, with 1.5 or 2 lines between sections. Use bold to highlight section names, as well as your name at the top of the document. Black and white is usually best – no need to include color. How Long Should Résumés For Teachers Be? While standard résumés are 1-2 pages in length, a teaching résumé can be slightly longer, depending on the type of role, your level of experience, and type of institution. For example, a teaching résumé for elementary school will likely be shorter (1-2 pages) than a teaching résumé for a third-level institution. Having a teacher resume that is 3 or 4 pages may be acceptable if you need to include sections like published work or participation in extensive professional development activities. If these additional sections are really important, consider including these training and development seminars, conferences, in-house formal training, and external training sessions as an appendix to your main resume. A résumé summary tells the reader who you are and why you’re a great fit for the job. The summary should be a concise paragraph focused on hard skills. I am a bilingual Elementary School Teacher with a decade of experience working with students and parents in French and English. My specific areas of specialization are elementary mathematics and science. I am familiar with teaching diverse populations in my community, including students with disabilities, students at-risk, and children from non-English/French language backgrounds. I am also a member of my district’s Education Strategy and Planning Committee, providing insight and input into curriculum assessment and implementation, program management, and the assessment and implementation of initiatives stemming from provincial assessment data. In the work experience section, list each role you’ve held, in chronological order starting with the most recent. Bullet-point specific tasks and responsibilities. Aim to keep each point to 1-2 lines maximum. If you’re well-established in your career, there’s no need to include full descriptions for earlier roles (6-7 years+), unless you have some very specific/noteworthy experience which is important to highlight. Employers don’t just want to know what you can do, they want to know what you have achieved. Be sure to include any significant achievements and quantify these as much as possible (e.g. “How much?” or “How many?”). Use action verbs to describe tasks and achievements (e.g. manage, lead, drive, provide, steer, handle, supervise, plan, oversee). Ensure each point focuses on hard skills or quantifiable achievements, and gives the reader a clear idea of what you did. For example, ‘Design, implement, and evaluate instructional and behavioural programs that enhance students’ social participation in family, school, and community activities’ or ‘Provided learning support to students diagnosed with learning disabilities, through phonics-based developmental program to help improve literacy skills’. When you’ve added your responsibilities and achievements, double-check that current bullet points are written in present simple tense (‘manage’) and previous roles are in past simple tense (‘managed’). Smith, J. and Jones, P. “Components of Comprehensive Literacy and 10 Reading Strategies.” International Journal of Modern Education, 7, Issue 14, 43-49, 2017. What Extracurriculars Matter For Teaching Résumés? Highlighting any volunteer experience, particularly anything related to education, is a great way to demonstrate your interest in people and the community outside of work. List any volunteer roles in much the same way as professional experience - organization, role title, dates, and a short description of your work and any significant achievements. Are you a member of any relevant professional committees or organizations? Do you speak any languages? Are you familiar with specific software, platforms, and tools that are useful for teaching professionals? Letting potential recruiters know about this can help you stand out above the competition. Start Writing Your Teaching Résumé Today! Now you’re ready to put it all together and create your own résumé! The sample résumé can be used as a template for structuring your own skills, education, and experience into a cohesive narrative. Have you included your name, contact information, and a short summary (with optional key skills)? Have you added your education and professional qualifications? Have you listed your relevant professional experience, in chronological order? Are current responsibilities in present simple tense, and previous jobs in past simple tense? Have you included (if relevant) separate sections for volunteer experience, conferences attended, professional memberships, committees, publications, presentations, languages, or technology skills? Last but very much not least: have you keyword optimized your résumé for the job you’re applying for? Take a look at job descriptions for roles you’re interested in, and check that the most important hard skills listed are reflected (if applicable) in your résumé.